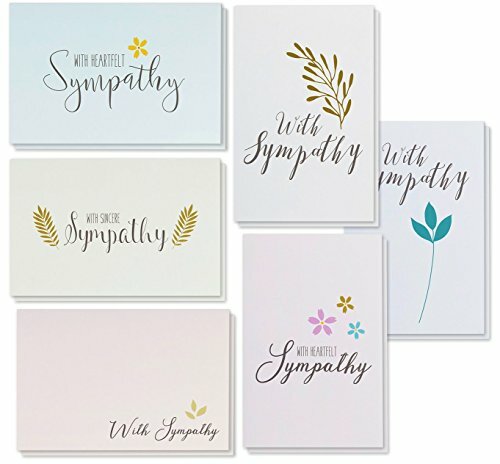 This assorted pack of 48 sympathy greeting cards will prepare you for your card-sending needs. Cut the hassle of rushing to the store and overpaying for cards. This pack consists of 48 blank sympathy cards to include your heartfelt condolences for corporate and personal use. Each card features one of lovely designs of flowers and leaves with sympathy messages. Make a statement with these greeting cards made of high-quality card stock that feels thick and sturdy. Each card measures at 4 x 6 inches and comes with corresponding envelopes. Ensure you have plenty of greeting cards on hand for when you need them. SYMPATHY CARDS BOXED SET: 48 pack of sympathy greeting cards featuring 6 lovely designs of flowers and leaves with sympathy messages. BLANK ON THE INSIDE: Contains 48 blank cards to offer your heartfelt condolences for business and personal use. SUPERIOR QUALITY: Each card is printed on high-quality 250 gsm ivory board paper card stock for elegance and extra durability. BULK SUPPLY: Ensure you always have plenty of greeting cards on hand for when you need them. Donald Verger Photography Fine Art Note Cards. Elegant Sea Glass Hearts. 3.5x5. Set of 8 Best Quality, Blank Folded Cards with Matching Envelopes. Unique as Thank You Notes, Invitations & Gifts.